Approaching my 50th season in this game we call life and nearly 20 years as a fire-fighting, gate-keeping, jobbing GP. I like to think I’ve got a few worthwhile thoughts on the human predicament, and health in particular, to share with any discerning reader. But then again, I’m a West Bromwich Albion supporter, so what do I know about running a successful team or indeed, winning tactics. I can tell you about relegation, boring lifeless football, arguments with team-mates, leadership in turmoil, I can even tell you who stole the taxi in Barcelona, but I won’t. In return for this heartache however, I get hope, promotions, the exhilaration of great escapes, pride and passion and an emotional rollercoaster which every footballer supporter recognises as a simple metaphor for life. I can also tell you that the NHS and other healthcare systems around the world are in a precarious position right now, on the brink of financial ruin and staring down the barrel of relegation to a lower league. A Team (NHS) crippled by injuries, overpaying for new players (drugs) who fail to perform as well as expected. Players (doctors and nurses) exhausted by the relentless onslaught from the opposition (chronic diseases), with only the agents (drug companies) appearing to benefit from such a desperate state of affairs. So, where does that leave the fans (patients), the loyal supporters, who pay their dues, week in week out (taxes), to keep this ailing “Super Club” afloat. Stressed out by the lack of facilities, the pressures of modern living, and a sense of hopelessness that breeds helplessness and a passive acceptance. Better stadiums, better training centres, better environments in which to thrive, with a greater emphasis on health and quality of play. A real “Health” service instead of the illness model we currently support. 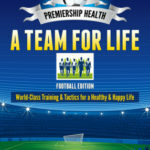 Unless we can turn this Club around by focusing on the “root causes” of chronic diseases, and promoting healthier lifestyles to reduce the strain on our limited resources, we are surely heading for a season of despair and suffering, and as a diehard football fan, I know what I’m taking about! And why do I care, and why should you care? Because, the future of our health, ultimately depends upon how we care about ourselves and those we love. It is the reason I wrote Premiership Health, and it’s the reason I passionately want to make a difference to improve people’s health.